A few years ago I wouldn’t fish with any colour Zeddie other than silver. The only “improvement” I’d consider being the small red plastic tags that came with the lure when I bought it. Nowadays I almost never fish with plain shop bought silver zed spinners. I have enjoyed considerable access over the last few seasons with white painted zed spinners. As a result of this success, I tend to stick with what I know works and shy away from anything new. We all tend to do this with our fishing. “If it isn’t broke we don’t try to fix it.” The same thing happens when we experiment with new fishing lure types and colours. We try out the new one, and if after a couple of minutes we haven’t hooked a fish, we cut it off and tie the old tried and tested lure back on – certain the new one is a dud. We don’t give the new lure a proper chance to prove itself one way or the other. I’m positive that painted zed spinners fish at least as well as polished silver models. This is also great news in that it’s much cheaper, and quicker, to repaint them than it is to have them re-silvered. The paint I use is the Odds ‘n’ Ends brand. It comes in glass jars at a cost of about $NZ6.00 and is readily available from Mitre 10 stores. You can apply this stuff with a small paint brush and it dries without any brush marks – not that the fish would notice the brush marks, they just look better with a sprayed appearance! When it comes to painting you’ll get a superior result if you remove the hooks, split rings and swivels. This makes them a bit harder to hold onto but it prevents the hardware from being gummed up with paint. I’ve found that for this job it pays to hit a few dozen nails into a length of board to use for hooks to hang them on while drying. If you are careful and aren’t so fussy about the end result you could still paint them with the hardware in place. In this case, you can use a cardboard box as a rack and push in the trebles as shown in the picture. 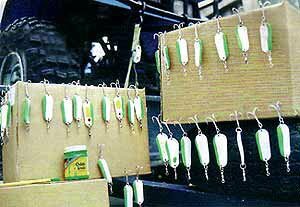 If you get a bit of paint on the hooks or split rings it won’t make any difference to the salmon! Although white shows up well in water with a little colour in it; I also prefer to apply a second colour for added “flash.” I reckon this makes a big improvement to the lure’s attractiveness. Fluoro lime green, also available in the Odds `n’ Ends range. It makes a great “flash” colour. 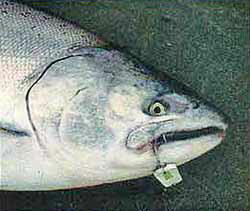 I like to apply it down one edge of the zed spinner, on both sides, to suggest the darker back of a ­small bait fish. Extra flash can also be added in the form of prism tape, or the excellent ‘eyes” available in the Witchstiks” range available from leading tackle stores. It is amazing how lifelike a zed spinner becomes with the addition of eyes. Another colour very much in fashion at the moment is yellow. I have only ever caught one salmon on a yellow zeddie so I guess I can’t really comment on the effectiveness, or otherwise, of this colour. Plenty of yellow zed spinners are sold in the stores, and I’ve witnessed other blokes catching salmon on yellow! If you have plenty of old worn zed spinners that have lost their shine why not get a bottle of paint and give it a go. 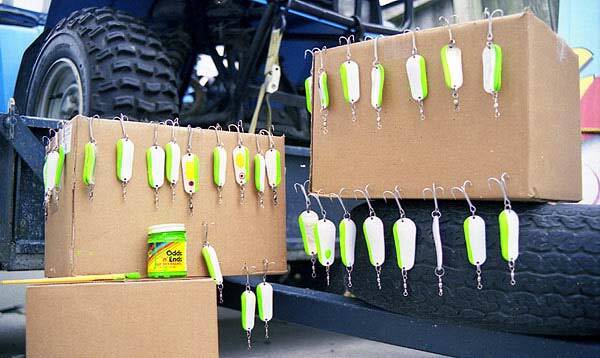 It also pays to check your hooks at the same time, replacing any that appear suspect.